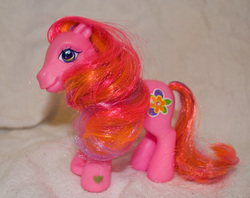 As a collector myself, I have a very high expectation for what a quality pony should look like and be represented as. It frustrates me when I am shopping to see an item listed as 'Excellent' condition, when the item in the photo is clearly mangled. I feel that I owe my customers a commitment to integrity and quality. The Ponies I list through e-bay have been carefully hand inspected, washed one at a time, and then combed and styled for an optimum display appearance. This takes time, and effort, so I may charge a little more for a pony that is truly of superior quality because I can vouch for the fact that it is completely worth that price. I try to avoid selling ponies that have any permanent damage, however, all of the 'Very Good' class ponies will have a flaw. Maybe a stain on their leg, maybe a scratch or a scar. Please read the description CAREFULLY to make sue that it is something you want. I remove all washable flaws, so I'm not going to mention a mark if it isn't there to stay. However, if it has a flaw and I still choose to sell it, I can promise it still has beautiful qualities. Especially good hair counts for a lot. Additionally, a huge factor on quality is the hair. I do NOT list a pony as Mint if it has bad hair. EVER. 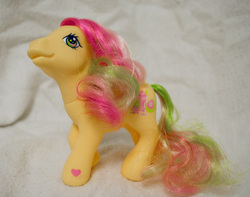 A MINT condition pony is a like new pony that is perfect. Hair will reflect this. My specific criteria is as follows.All of my Ponies are ranked, Mint, Excellent, and Very Good. Mint: A pony that has every appearance of being BRAND NEW. No flaws, perfect hair. Perfect. Excellent: A pony that is fantastic, lovely, and only has one or two flaws. The overall condition of the pony shows as beautiful and is excellent. Very Good: A pony with noticeable and clear flaws. Still has an overall presentation of being only lightly used, and compensates for flaws with other good qualities. Or email me directly through the Contact Form below! Dude. You do NOT mess with the Unicorn.